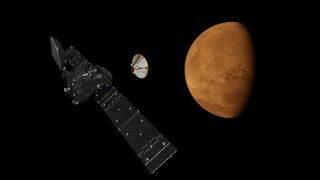 If the European-led ExoMars mission successfully launches into space tomorrow (March 14) as planned, scientists will have two intrepid new scouts in their search for life on the Red Planet. The Trace Gas Orbiter (TGO) will look for key elements in Mars' thin, dusty atmosphere, while the Schiaparelli lander will serve as a short-lived Red Planet weather station. One goal of the mission is to prove out technology for a more ambitious life-hunting rover that's scheduled to launch in the second phase of the ExoMars program in 2018. But TGO and Schiaparelli will also be looking for signs of life and learning about Martian environmental conditions using their own sophisticated scientific payloads. "TGO will be like a big nose in space," Jorge Vago, ExoMars project scientist, recently told AFP, and indeed, the orbiter is expected to sniff the Red Planet’s atmosphere for its five years of operation. Scientists will use TGO to measure gases like methane, which could hold clues about whether life ever existed, or still exists, on Mars. Most of the methane in Earth's atmosphere comes from biological sources — plants that are rotting, for example, and animals that are digesting. Methane has already been measured on Mars, but the gas is not a sure indicator of alien life; it’s possible it could be produced by simple lifeforms like microbes, but geological reactions and volcanic activity could also explain methane's presence on the Red Planet. Water is another ingredient for life that scientists have been trying to measure on Mars, and another instrument in TGO’s science payload will contribute to this search. The Russian-built FREND (Fine Resolution Epithermal Neutron Detector) will indirectly look forwater-ice deposits up to 3.3 feet (1 meter) below Mars’ surface. Since Mars has such a thin atmosphere, the planet's surface is constantly bombarded with harsh cosmic rays that break apart atoms. This reaction releases high-energy neutrons that are then captured by the elements in the surrounding Martian dirt or released back into the atmosphere. Different elements — like hydrogen, a key ingredient in water — interact with neutrons in characteristic ways. FREND’s measurements of the neutrons released from Mars' surface will allow scientists to make maps of the hydrogen concentration in Martian soil, according to ESA officials. Once TGO enters orbit around Mars in October, expect pretty pictures; the satellite will obtain high-resolution images of Mars’ surface using the Colour and Stereo Surface Imaging System, or CaSSIS. The Swiss-built CaSSIS promises to produce detailed images of the Martian surface, capturing 15 feet (4.6 m) per pixel from TGO’s orbiting altitude of 250 miles (400 kilometers). Previous Mars cameras have, however, produced sharper images. The HiRISE camera onboard NASA's Mars Reconnaissance Orbiter, for example, takes pictures at 1 foot per pixel (30 cm per pixel) from an altitude of 186 miles (300 km), and the Mars Orbiter Camera aboard the Mars Global Surveyor acquired pictures that were about 4.9 feet (1.5 meters) per pixel. CaSSIS will take images of scientific targets like the seasonally appearing dark streaks on Mars' slopes, which scientists believe are evidence of salty water flows. The camera will also photograph potential landing sites for future missions, looking out for slopes, boulders and other hazards, according to ESA officials. Schiaparelli and TGO will separate just days before they reach Mars. The landing capsule is then expected to touch down on the Red Planet on Oct. 19, with the help of a parachute and a thruster system. Though Schiaparelli has a short expected lifespan, it is carrying scientific instruments that will take advantage of its plunge through the Martian atmosphere and visit to the surface. For instance, the capsule is packing one experiment called AMELIA, which stands for Atmospheric Mars Entry and Landing Investigations and Analysis. AMELIA will collect data on the temperature profile and wind characteristics at different layers of the atmosphere; it will also detect changes in the abundances of aerosols, such asfine dust and ice particles. Once Schiaparelli lands, a wakeup call will be sent to its scientific package called DREAMS (Dust Characterisation, Risk Assessment, and Environment Analyser on the Martian Surface). DREAMS will essentially act like a meteorological station on Mars. It has a suite of sensors to gauge the wind, humidity, pressure and temperature on the Red Planet for two to eight Martian days, or sols, until its battery runs out. DREAMS will also collect data on Martian dust and provide the first measurements of electric fields on the surface of Mars. Together, these two types of measurements could shed light on how the interaction of electric fields and dust creates intense dust storms on Mars. The landing has also been purposely planned to take place during the Martian dust storm season, and project scientists have said they hope DREAMS will provide data on the risks dust might pose to future spacecraft and human explorers. Editor's Note: This article has been updated to clarify the pixel scale of HiRISE.